Ease your body and mind into a state of calm with our CBD E-Liquid. Hemp Extract can help relieve anxiety, reduce inflammation, ease pain, encourage natural sleep and more. By vaping Hemp Extract, the medicinal benefits can enter your body quickly to promote relaxation and wellness. 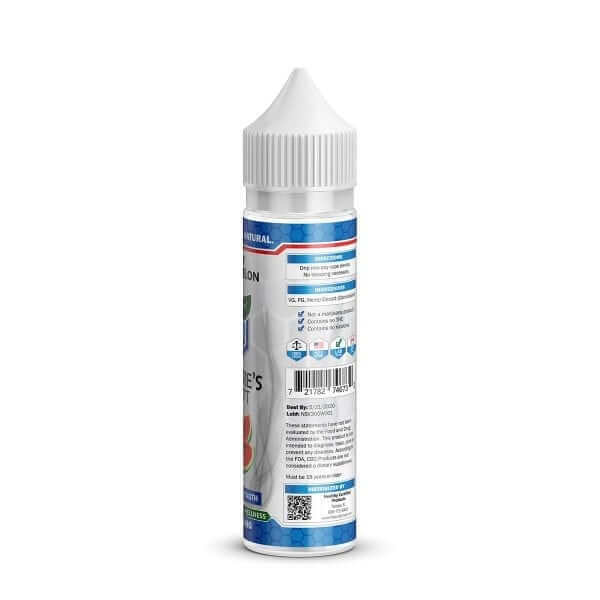 We recommend our Hemp E-Liquid for medium or moderate level dosing. Our Hemp Extract is sourced from organic-certified, premium Industrial Hemp and we verify the potency and quality with a third-party lab. What is Hemp Extract E-Liquid? 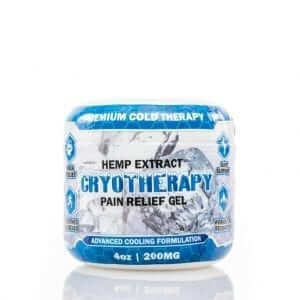 Hemp Extract is a therapeutic supplement derived from nature. It is packed with compounds called “cannabinoids” which work in harmony with the cannabinoid receptors found naturally in your body. Cannabinoids can have wide-ranging effects throughout the body, and they impact for both mental and physical health. Our Hemp Extract is federally legal and completely free of THC. Hemp Extract has no psychoactive properties, so it will not make you feel “high.” Rather, Hemp Extract can help you relax into a state of calm. Hemp Extract E-Liquid combines the medicinal benefits of Hemp with the relaxing experience of vaping. As you gently inhale our CBD E-Liquid, you are allowing the therapeutic properties of Hemp Extract to quickly absorb into your body through your lungs. Nature’s Script E-Liquids offer our premium Hemp Extract in its purest form, and they do not contain nicotine or any other harmful chemicals. 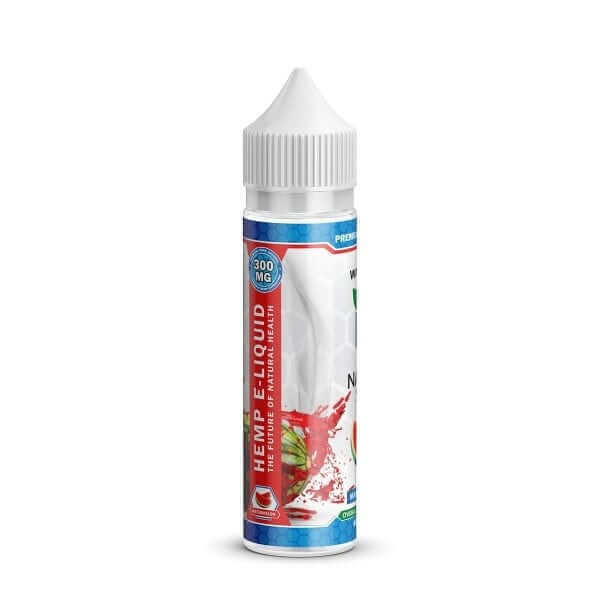 You personalize your CBD E-Liquid vape by choosing between delightful flavors including fresh mango, blueberry jam and juicy watermelon and selecting a potency level of 75, 300 or 1000mg. What are the potential benefits of Hemp Extract E-Liquid? Hemp Extract works with receptors throughout your body to help improve many areas of health. It may also help target specific conditions like insomnia, anxiety, depression, chronic pain and inflammation. Hemp Extract can also act as a daily supplement that delivers a boost of overall wellness benefits. Because vaping Hemp Extract is a relaxing experience with fast absorption, our E-Liquids are a great option from sufferers of panic attacks or pain flare-ups. How do I take Hemp Extract E-Liquid? 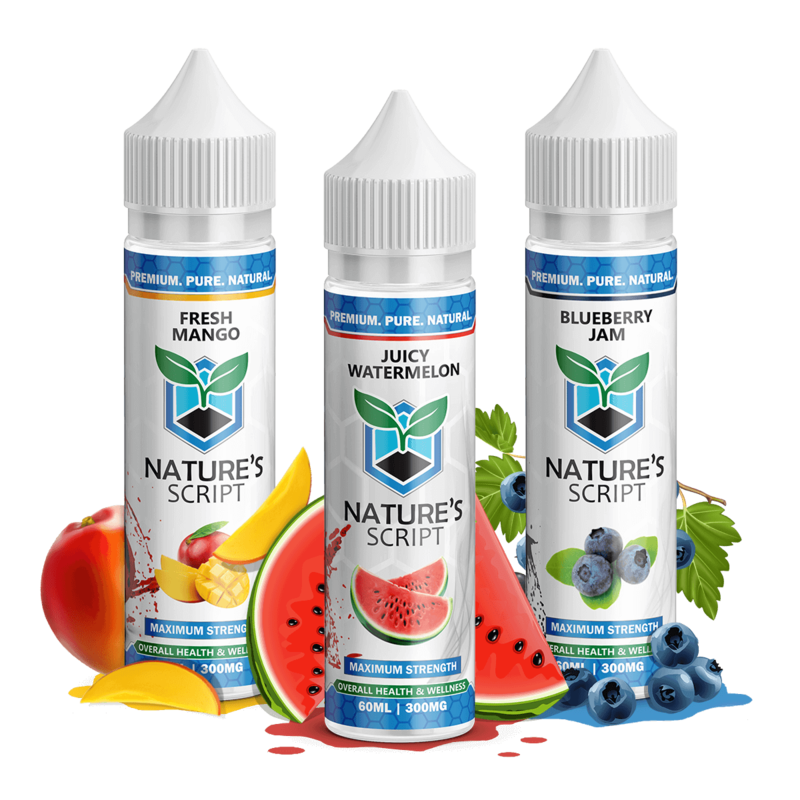 Simply add Nature’s Script CBD E-Liquid to any vape device and enjoy. Be mindful of the potency level you select, as it determines how much E-Liquid you will need to vape to achieve your desired dose. If you’re new to Hemp Extract, we recommend starting with a small dose, like five to ten milligrams, and gradually increase your dose as needed. It’s our goal to deliver the therapeutic benefits found in natural Hemp in pure and potent products. All Nature’s Script Hemp Extract products begin with organic, premium-grade Industrial Hemp grown in the United States. We manufacture all products in-house, with purity and quality as top priorities through every step of production. We verify the quality of our Hemp Extract with a third-party lab, so you can feel confident with your products. 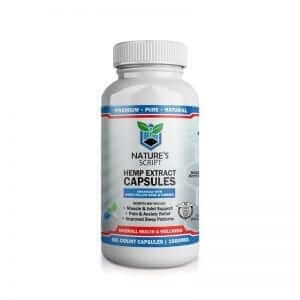 When you buy from Nature’s Script, you can also expect exceptional customer service and shipment coming directly from our facilities. Very fast shipping. I got my package in 3 days of ordering. You guys have excellent service. Mango flavor is good and smooth. Nice smoke too. I like your e-liquids for their purity and smoothness. Always consistent and predictable. This is a solid hemp vape oil. the blueberry flavor is sweet, but not too sweet and pretty bold. I think the 60ml will last me a while. I vape in the evenings before bed and i fall asleep better and stay asleep until it’s morning. Overall really happy with this product. I never would have known how much I would LOVE vaping! Oh my gosh. It’s so relaxing. It give me a spa-like experience and the vapor tastes like fresh fruit. I feel really calm and peaceful when I vape the hemp extract and it helps me wind down when I feel stressed. As a mother of four, that can be quite often lol! I love this so much. Thank you!! I can definitely tell this has hemp extract in it, however the results aren’t that strong. I guess 75 mg isn’t super strong. I might need a higher potency, but I am happy with the product. I enjoy the watermelon flavor. Finally found a no THC vape I might like. Just placed my first order after searching Google you came up. The mango flavor is so tasty and I love the relaxing feeling!! Easy transaction and I can’t wait to try the oil. I’m in love with the watermelon flavor. Sooooooo good. Your e-liquids are very easy to vape and don’t clog up my device. Good quality. Take a few hits before bed and I am guaranteed a good nights rest. Thank you all at Nature’s Script! wow…this is a lot of liquid for the cost. I believe that the watermelon flavor has got to be the best. Its so refreshing and it vapes very clean. Your vape is great, and was delivered quickly. Thank you. Ordering was very streamlined and easy. Good work. I really enjoy the watermelon vape. I vape off and on during the day and it helps the day go easy for me. I love this product and will keep buying it. Love the feeling it gives, definitely relaxing. Love the flavors I got, will be buying these as presents for family and freidns. I just ordered the 1000mg Watermelon. Hope it comes in quickly. Ordered the blue berry. It wasn’t that great. I will try watermelon next. It’s good. Helps with my PTSD, OCD, and anxiety. I highly recommend it to anyone with these symptoms. Not bad. Not spectacular, but pleasant tasting and smooth. Very fast shipping and excellent flavor. The Blueberry Jam is really good. Need more flavors to choose from. I like the Watermelon, but would like to be able to have more variety. Are more on the way? The Blueberry Jam flavor is really good. Very nice. It’s a very good tasting vape that I enjoy daily. The price is good for the quality you get and you almost always get what you pay for in life. When I started, I tried and liked your 300mg. I just finished and reordered the 1000mg in Watermelon flavor and I used a coupon to make it a little more affordable for me. Very good and flavorful. Mango is a good one. Greeeeeeaaaaaaat customer service. My order was messed up. They corrected it and sent my new package 2-day air. This is powerful. One of the best vapes I’ve come across. Going to try your other flavors. Good quality vape. Flavorful and not overbearing. I like the watermelon a lot. I’m lovin’ the blueberry jam flavor. Really nice. Need more flavors to choose from. Watermelon is good. But I’d like to see some others. After years of serious chronic lower back pain I started vaping and it has been the greatest thing for my back. Your blueberry jam is my favorite flavor I’ve ever tried. And it’s effectiveness is unsurpassed. My back thanks you. The blue berry flavor is really good. I like it a lot. I want to try the mango next.. I must let you know… this took away my anxiety and totally relaxed me. It’s potent. I’m happy with it. It got here fast and it was a very relaxing vape. I love the huge smoke and great flavor! Your e-juice flavors are very tasty! I found it not help with my muscular pain but it DID take away my migraine headaches. Maybe I need a stronger dose? I’ve been a vaper for years. Have tried a ton of brands and flavors. Your watermelon is one of THE BEST I’ve ever tried. Ordered another bottle. Great product !!! Really works fast on my carpel tunnel and arthritis. More people should try this before the CT surgery. I’m glad I did. Very nice! I will order again and try a different flavor. Finding this really toned down my anxiety. I wouldn’t be without it now. Outstanding flavors and good smoke. Watermelon flavor is flavorful and smooth. I’ll be getting more of that. Some of the best customer service I’ve ever had. I’ve had to call a few times and each time I was treated with respect. This is a good company to deal with. Is the bottle 60 ml or 16.5 ml? ?